One of Bali’s spiritual pillars, Uluwatu Temple which is magnificently located on the top of the cliff, is about 70 metres above sea level and highly recommend when in the country. Established during the 11th century, this temple is another prominent sea monument offering stunning sunset backdrops. Also known as Pura Luhur Uluwatu, if you happen to be in the area, experience the sunset delights overlooking the mesmerizing views of the sky and beautiful Indian Ocean. The architecture of the temple is Balinese which is designed quite uniquely as it holds its great traditional values which adds up to the temple’s appeal. How popular is Uluwatu Temple? 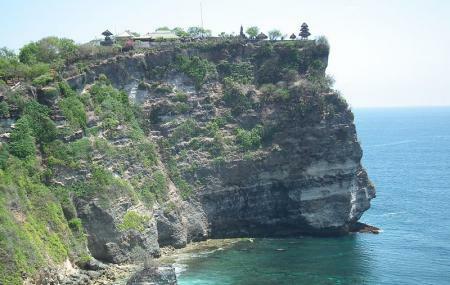 People normally club together Pura Luhur Uluwatu and Tanah Lot Temple while planning their visit to Uluwatu Temple. What i like most is the view and fascinating scene of the temple that located on the hill. From there, you can see an amazing sea in below of the hill and makes you mesmerize. Besides there was the monkey forest that were a living home of hundred or maybe thousand monkey. The view much more amazing when the sunset takes place.what a wonderful experience. Amazing sunset view. It is totally worth it to go up there. The ocean, the sunset and the cliff all were in harmony. Felt really calm and peaceful up there. Just be careful of the monkeys, they almost snatched my bag. There was a performance going on too but you need to pay again to watch, we already paid for the entry, they could have included it in the ticket itself though.